WooCommerce Request A Quote plugin lets your customers ask for a price estimate of a list of products they are interested from your WooCommerce shop. Using WooCommerce quote plugin customers can create their own list of desired products and receive price estimate from the site administrators. Quotations are a great way to deal when selling certain types of products to increase your online shop performance. One of the biggest limits in online business is the difficulty to negotiate. For large quantities of same or couple products, supplier and buyer usually meet physically. They talk to find a reasonable solution for both parties. If you sell custom-made products, then you surely understand possibilities of using quotation. The fixed price can’t be set. The price always depends on a specification, set by a customer. For example, say a client wants a custom-built closet. The cost depends on the materials he chooses, the size of the closet, the time by which he wants it ready, etc. The price would also depend on the total pieces he is interested in buying. Maybe customer also wants a chair, center table, and a bookshelf. Then, the price for the entire set would be different. How to arrange a price with a customer in this cases? Well, you would first need to know what the customer is looking to purchase. You need to add a Request a Quote functionality. This will help customers to make a price inquiry for the products they are interested in buying. But how to make it possible using your WooCommerce store? How to make a compromise that should be agreed by both buyer and seller? All this becomes possible for online shops thanks to QuoteUp from WisdmLabs. WisdmLabs is a well-known company that creates mostly WooCommerce oriented plugins. If you follow my blog posts (I am sure you do) then you know I have already written about some of their plugins. If you follow my blog posts (I am certain you do) then you know I have already written about some of their plugins. QuoteUp is a customizable quotation and proposal request management system for WooCommerce. It allows you to handle quotes in your WooCommerce shop. This plugin is a premium extension to the WooCommerce plugin. You must have the WooCommerce already installed. It adds a quote request functionality which interested customers can use to send you a quotation request. QuoteUp adds a proposal request button for all or selected products in your store. Interested visitors are then presented with an option to quote an “expected price” and to add a personalized message requesting a purchase proposal. This proposal is forwarded directly to the owner of the store. Once completed, the updated proposal request is displayed on your admin panel where you can view it in the form of an editable table. You can then accept buyers proposal or propose price you wish to sell it for and send it back to the customer. The customer receives the proposal as a PDF via an automated mail. Then he/she can choose to accept or reject the proposal. On approval, the customer is automatically redirected to the checkout page to complete the purchase. QuoteUp works well with multiple products and gives you a variety of options. How is QuoteUp different from existing quote request addons for WooCommerce? QuoteUp brings flexibility with a customizable quote request form. The form contains basic fields, and can be extended by adding additional fields. Customers don’t need to send multiple quote requests for different products. Thanks to the multi-product quote cart option, a single quote can be requested for multiple products at once. You can view quote requests from admin panel, adjust product prices and quantities to create a quote. Upon choosing to send a quote, QuoteUp dynamically generates a quote PDF and emails it to the customer. Customers have the option to accept or reject a quote. Once offer accepted, customer is directly taken to the checkout page to make purchase. Upon purchasing QuoteUp from WisdmLabs site, you will receive download link for the plugin and a purchase receipt id to your registered email. Download quoteup.zip using the download link and upload it by going Plugin —> Add New menu and click on the “Upload Plugin” on your site. After the plugin has installed successfully, proceed to activate the plugin by clicking on the “Activate Plugin” link. A QuoteUp License sub-menu will be created under Plugins menu in your dashboard. Upon entering a valid license key a QuoteUp menu will be created in your dashboard and button labelled ‘Request a Quote’ will be added to each WooCommerce product page. The first step is to allow customers to select the products they are interested in. That’s how quote request systems work. The customer needs to take the first step. By default WooCommerce provides an ‘Add to Cart’ button, which allows purchases. The ‘QuoteUp’ extension for WooCommerce provides you a quote cart functionality. This functionality adds a ‘Request a Quote’ button on every WooCommerce single product page. This feature is similar to the ‘Add to Cart’ option. But instead your customer can use it to add products to a ‘Quote Request’ list. The customer then has the option to make a single price quote request for all the products at once. This is a time-saver for you and the customer. The customer does not have to send out multiple emails. Single email which contains all the products, along with their quantities, will be enough. Potential customer also has the option to add a short note to the email. You can track quote requests from the admin panel. QuoteUp allows you to adjust product prices and quantities and send quotes to interested customers right from the admin panel. Be noted that ‘Request a Quote’ button does not replace the ‘Add to Cart’ button. If you want to disallow the purchase of a particular product in your WooCommerce store, you can leave the product price field blank. QuoteUp also has an option to disable the ‘Add to Cart’ button for all products, or for particular products as needed. The styling of the button or the button position can be changed from the admin settings. Upon a user clicking the quote request button, a modal dialog appears. An interested customer can request a quote by filling up the required fields and clicking on the ‘Send’ button. Using the Multiproduct Quote option, you can allow users to request a quote for multiple products at once. Upon activating the option, the quote request button turns into an add-to-quote-cart button. Customers can add multiple products to the quote cart, and then make a single quote request for all products at once. Under “Settings” you can find options such as the visibility of the quote request button, form field settings, PDF settings, email settings and more. Enable QuoteUp for all products? – This option allows you to enable the display of the quote request button on all product pages. Out of Stock – Check this option to display the quote request button only when a product is out of stock. 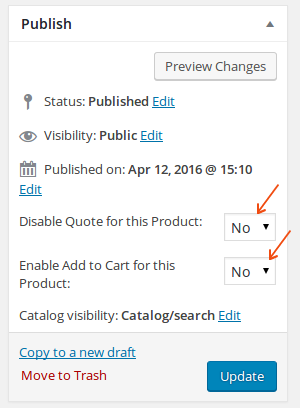 Archive Page – If this option is checked, the quote request button is displayed on WooCommerce product archive pages. Show Price for all products? – This option enables the display of the product price across all products. Enable Add to Cart for all products? – This option allows you to enable the display of the ‘Add to Cart’ button for all WooCommerce products. NOTE: To convert WooCommerce into a cart only store, set both these options to ‘No’. Enable the “Multiproduct Quote” option to allow interested customers to request a quote for multiple products at once. The multiproduct quote functionality adds an ‘Add to Quote Cart’ button on all WooCommerce products. Customers can add products to the quote cart and then make a single quote request for all the products at once. This option allows you to apply the global set values for ‘Show Price for all products?’, ‘Enable Add to Cart for all products?’ and ‘Enable QuoteUp for all products?’ across all individual products. Under “PDF Settings” you can specify company name, company email, company address and logo for PDF. Data provided here will be used to add your company’s information on the PDF template. You will need to create a quote approval/rejection page. This is the page to which a customer is redirected to when he/she clicks the ‘Approve/Reject Quote’ link in the email sent along with the quote. QuoteUp button label – Use this field to set the label for the quote request button. The value by default is “Request a Quote”. QuoteUp button location – You can choose to display the quote request button after the product summary, or at the end of the product page. Show QuoteUp button only when product is Out of Stock – Enable this option to show the quote request button only when a product is out of stock. Display QuoteUp button as a link – If this option is checked the quote request button will be displayed as a link instead of a button. Display QuoteUp button on archivepage – The quote request button is displayed archive pages such as ‘Shop’ and category archive pages. Apply Global settings for an individual product – This option allows you to apply the globally set values across all individual products and overrides the values set for these products. Display ‘Powered by WisdmLabs’ – If this option is checked, ‘Powered by WisdmLabs’ text will be displayed on the quote request dialog box. Enable ‘Send me a copy’ option – Allow customers the option to receive a copy of the quote request email. Display telephone number field – If this option is checked, a field for accepting the customer’s telephone is added to the quote request form. Make telephone number field mandatory – The phone number field will be made mandatory for the end user. Recipient’s Email ID: By default the recipient email id value is set to admin email id. You can set multiple e-mail ids as well. Default subject: The value specified here is used to set the subject of the quote request email, in case the customer does not enter a subject. You can use the ‘Add Custom CSS’ field to add your CSS which will be applied to the button and quote request form. Color settings can be changed by selecting ‘Manually specify color settings’ and picking the colors according to your preference. View: Quick view of the quote requests made displayed in a table. You can hover over the items quantity under the ‘Item’ field, to view the products added to the quote request. Delete: You can delete individual records, or select multiple records to delete. Export: You can select individual records to be exported or export all records. You can set a new purchase price for products, update the quantity and then send a quotation to the customer using the ‘Send Quotation’ option. You have the option to add a custom message before sending the quotation. On every product settings page there are options provided to toggle the display of the ‘Add to Cart’ and the quote request button for the product. NOTE: If the ‘Apply Global settings for individual product’ setting is checked, then global settings will be applied to every product. If individual product settings have to be applied then remember to uncheck this option under Settings -> Form Options. Every quotation email sent to a customer contains a unique link which the customer can use to accept or dismiss the purchase quotation sent. Upon visiting the link, the customer has to enter his email ID to authenticate it. If the customer accepts the quote, the products are added to the cart. The customer is then taken to the checkout page with the updated prices. If the customer selects the ‘Reject Quote’ option, he is asked the reason for rejecting the quote before rejecting it. The admin can then resend the quote. Customers always want the best possible deal. Instead asking them a price quote for individual products, they can benefit by requesting a quote for a bulk order. This doesnt necessarily mean bulk order for a single product. This can mean the customer is interested in purchasing a set of goods, and wants to know the best price for the entire purchase. It is easy to allow the customer to select the needed products, their quantities and then request a quote for the total. This functionality is also provided by the QuoteUp WooCommerce request a quote plugin. The process goes like this: Customer selects the products → Customer sends you a mail asking for a quote → You reply with proposed rate → Customer accepts or sends another quote. How to add “Request A Quote” for all Products? Depending on the products you sell, you might be looking to add an inquiry price button on every product page, or to disable completely the purchase (or ‘Add to Cart’) button. Settings these options will display the inquiry price button instead of the Add to Cart button on every WooCommerce single product page. QuoteUp also has an option which allows you to display the button on product archive pages such as the ‘Shop’ or product category pages. There is also an option to show/hide the price for a particular product. This option will enable you to hide the ‘Add to Cart’ button while still being able to display the price for the product. In case you wanted to select a few products which could only be inquired about and not bought, you’d have to disable selectively the ‘Add to Cart’ button for those products and display the ‘Request A Quote’ button. To do so, you have to ensure that QuoteUp is disabled by default and the ‘Add to Cart’ buttons is enabled by default, for all your products. You would need to set Enable QuoteUp to “No” and Enable Add to Cart to “Yes”. NOTE: Ensure that ‘Global settings’ is set to “No” so that the general options set are not forced for every product, and individual product settings can be applied as applicable. Head over to individual add/edit settings of individual product pages, to selectively display the buttons as needed. Do remember to save the settings once you’ve made any change. This change will ensure that the button is displayed only for the selected products. QuoteUp allows the WooCommerce store owner to send quotes for requests made. All the quote requests made by a customer are sent to a shop owner via email and are also available in the admin panel for easy access. As the store owner, you can edit the product quantity and price for a quote request, and send the quote to the customer. QuoteUp automatically generates a quote PDF and emails it to the customer. Reject the quote – store owner can edit the prices and resend a quote. If you are acquainted with WisdbLabs plugins for WooCommerce, you may know that they also have Product Enquiry WooCommerce addon. So which one to choose? QuoteUp quotation plugin or Product Enquiry plugin? An inquiry is a question or information request made by your potential customer on products or services you offer. This could be a price request or general details. A quotation is an agreement you offer to your customer. A quotation request could be initiated by the customer or the store owner. A quotation contains an offer you make to the customer agreeing to charge a predefined price for a particular quantity of products. The customer has the option of placing an order within the agreed conditions or the opportunity to reject the proposal. Quotation and inquiry systems are essentially contact options for a customer. So they have some functionality in common. Although QuoteUp is relatively new to the list of WooCommerce quote request and sales plugin, it’s packed with a lot of functionality. What about Product Enquiry Pro users looking for a Quotation functionality? Product Enquiry Pro customers looking to add the quotation and sales functionality to their store can easily move to QuoteUp. You do not need to pay full price for QuoteUp, just the difference. NOTE: Product Enquiry Pro and QuoteUp cannot be used together. Customers can ask for an estimate and admin can answer them back with a quotation proposal. Customers can either accept or reject the offer for the WooCommerce products they have added to the quote. Negotiation becomes possible, and this can increase purchases in your WooCommerce shop. Price for paid version is $59 for single site license. There are also plans if you need license for more than one site. You can also join the YITH membership club to get much more addons for WooCommerce. This gives an opportunity for the site owner to provide special rates based on the quantity/amount of the order. At the same time it allows the customer to bargain for better prices. This plugin is ideal for rental stores, providing custom services, or anything that would benefit from the customer being able to receive a custom quote. Customers add the products they are interested into their wishlist and when ready click a button. Then their list is sent to you along with customer name, email, and an optional short message. Price for this plugin is $17 on Codecanyon. This Request for a quote plugin is ideal for stores providing custom services or anything that needs option to receive a custom quote. Customers add the products they are interested in to their quote list. When ready they just need to click a Request for a quote button and their quote request is sent to you. This extension adds all the necessary tools so customers can make customer requests from the frontend. Shop owners can create and send customized commercial terms and price proposals from the backend. This way, the whole quote request process is 100% integrated into Woocommerce’s order flow. Each installation of the plugin will require a license key in order for you to receive updates and support. Propoza’s Quotation Extension enables your customers to submit quote requests from the WooCommerce front-end. On submitting the request for a quote, the customers receive an email confirmation for the quote requested. The storeowner can add a custom price for each requested item and send a proposal back to the customer. The customer will be able to accept or decline the offer via a client dashboard or straight from the email and check out with the custom prices. Propoza is free with the option to convert proposals to orders in your store which is paid 15 EUR per month. Most WooCommerce store owners sell products for a stated price. But have you ever considered using WooCommerce to sell products which don’t have a fixed price? For stores which do not have a fixed price for the products being sold, services being offered, or work purely on a quote system, QuoteUp offers an ideal solution. It provides your customers a quick and easy way to request a price quote for products they are interested in, and allows you to close the sale. WooCommerce out of the box can only be used for step 1. The rest of it you’d have to handle manually. Thanks to various extensions and addons for WooCommerce, there is a plugin to help you out! You can sell custom services which do not have a set price, but can be inquired about and sold based on a customer’s specific requirements. QuoteUp eliminates the need to manually quote and track offers. Now over to you my dear reader. Do you think there are better quotation management plugins for WooCommerce? Is there a feature you think is missing? Thank you for letting me know. Wish you luck with your plugin! This is exactly what I needed. Thanks for this.